McCONNELSVILLE, Ohio — AEP’s ReCreation Land, 60,000 acres of company-owned reclaimed surface mine land in southeastern Ohio, hosted 1,700 children and adults last month in a variety of fishing and environmental education events. Participants included people of all ages, from elementary grade school students to older adults with disabilities. 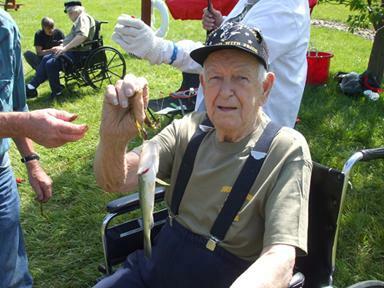 A participant in the Senior Day event shows off his catch at AEP’s ReCreation Land. ReCreation Land is one of American Electric Power’s best known symbols of environmental outdoor recreation. This award-winning project has been developed on land that was once surface mined for its rich coal deposits. Through vigorous reclamation efforts, which include the planting of over 63 million trees and the establishment of more than 600 lakes and ponds and nearly 380 campsites, the company has turned this former mining region into a vibrant recreation area. The property is located north of McConnelsville, Ohio, in parts of Morgan, Muskingum, Noble and Guernsey counties in east-central and southeastern Ohio. Many of the groups focused on fishing, or learning to fish, while others focused on environmental education. The events took place at Hook Lake, a popular outdoors education venue at ReCreation Land. The Ohio Department of Natural Resources – Division of Wildlife served as a major partner with AEP on each of these events. May 10 – Junior Bass Federation Shoot-Out: 50 young boys and girls from Morgan and Perry counties competed in a fishing tournament against a club from Pickerington, Ohio. Approximately 100 people participated. May 12 – Hooked on Fishing Not on Drugs (HOFNOD). A total of 303 children registered at the HOFNOD event with a total of approximately 550 people participating. Additional event partners included the Morgan County Sheriff’s Office, Morgan County Behavior Health Choices, The Wilds and the Morgan County Key Club. May 14 – Woodsfield Elementary outing: A total of 122 kindergarten and elementary school children fished at Hook Lake. There were approximately 50 adults that helped with the fishing event. A grill-out followed the fishing. This event was conducted with support from the Passport Program of Monroe County. May 15 – Morgan County Soil and Water Conservation District (SWCD) Day. Approximately 450 children participated in the outdoor environmental program with 30 educational stations established throughout the campground. The 600 total participants also enjoyed a grill-out luncheon before returning to school. Additional event partners were SWCD of Morgan County, Anadarko and North Valley Bank. May 17 – Monroe County Board of Mental Disabilities. Twenty students from Woodsfield Elementary visited Hook Lake for a day of fishing. A grill-out luncheon followed the fishing. Approximately 50 people participated in the event. May 19 – “Senior Day” at the Lake. This is a program conducted through the National Wild Turkey Federation that pairs able-bodied persons with disabled individuals for a day of fishing. A total of 21 people attended the event, including 19 residents from Riverside Country Care Center, Highland Oaks and Muskingum Valley Nursing and Rehabilitation. May 21 – Morgan County Passport Program: A total of 190 students attended the passport fishing program, and each participant received a fishing pole for completing the program. Find more information on outdoor recreation opportunities at ReCreation Land.